A dangerous confrontation is rapidly emerging on the Korean Peninsula between the United States and North Korea, with the potential to plunge North East Asia and the rest of the world into a catastrophic conflict between nuclear-armed powers. Amid a barrage of commentary in the American and international media inflating the threat posed by the Pyongyang regime, the Trump administration is actively considering “all options” to disarm and subordinate North Korea. The immediate pretext is North Korea’s test-firing of four medium-range ballistic missiles last week, following the launch in February of a new intermediate-range missile. 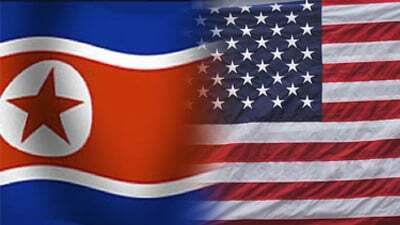 However, the drumbeat of US military threats has been preceded by months of high-level discussions in American foreign policy and military circles over action to prevent North Korea building an intercontinental ballistic missile (ICBM) capable of hitting the continental United States. President Barack Obama, who, according to the New York Times, was considering the most extreme measures against Pyongyang, urged then-President-elect Donald Trump to make North Korea his highest security priority. Since taking office, the Trump administration has been conducting a top-level review of US strategy toward Pyongyang, considering every option, including, as a White House official told the Wall Street Journal, those “well outside the mainstream” such as “regime-change” and military strikes on North Korean nuclear facilities and military assets. The Chinese government is acutely concerned at the prospect of war on its doorstep involving its ally, North Korea. In unusually blunt language, China’s foreign minister, Wang Yi, warned that the United States and North Korea were like “accelerating trains coming toward each other with neither side willing to give way.” The Trump administration flatly rejected China’s proposal for a “dual suspension”—of North Korea’s missile and nuclear programs and massive US war games underway in South Korea—as the basis for renewed negotiations. By ruling out talks, the White House is setting course for confrontation, not only with North Korea, but also with China. By preparing for military action against North Korea, the US is also menacing China, which it has identified as the most immediate challenge to American global hegemony. The Trump administration has already threatened trade war measures against China and military action against Chinese islets in the South China Sea. The US deployment of a Terminal High Altitude Area Defence (THAAD) anti-ballistic-missile battery in South Korea, which began last week, is part of a network of integrated anti-missile systems designed to facilitate nuclear war with China or Russia. A pre-emptive US attack on North Korea would be an act of war with incalculable consequences. While no match for the military power of US imperialism and its allies, North Korea has a huge army, estimated at more than a million soldiers, and a large array of conventional missiles and artillery, much of it entrenched along the heavily fortified Demilitarized Zone and able to strike the densely populated South Korean capital of Seoul. In the event of war, the scale of devastation would be immense just on the Korean Peninsula alone, even without the use of nuclear weapons. In 1994, the Clinton administration was on the brink of attacking North Korea’s nuclear facilities but pulled back at the last minute after the Pentagon gave a sober assessment of the likely outcome—300,000 to 500,000 South Korean and American military casualties. A war now is unlikely to be conventional or limited to the Korean Peninsula. The Pentagon has been actively planning for a far broader conflict. In December 2015, US Joint Chiefs of Staff Chairman Gen. Joseph Dunford said any conflict with North Korea would inevitably be “trans-regional, multi-domain and multifunctional”—in other words, a world war involving other powers and the use of all weapons, including nuclear bombs. The immediate danger of war is compounded by the acute political, economic and social crises of all the governments involved, as epitomised by last Friday’s impeachment and removal of South Korean President Park Geun-hye. Faced with an early election and the prospect of defeat, the ruling right-wing Liberty Korea Party has a definite incentive to whip up war tensions with North Korea to divert attention from the political crisis at home. Moreover, the current US-South Korean military exercises, involving more than 320,000 military personnel backed by the most sophisticated US air and naval power, provide an ideal opportunity for striking North Korea. As of last year, the annual drills, which amount to a rehearsal for war with Pyongyang, have been conducted on the basis of aggressive new operational plans, which include pre-emptive strikes on North Korean military sites and “decapitation raids” to assassinate the country’s leadership. The response of both the Chinese and North Korean governments to US threats is utterly reactionary: on the one hand looking for a deal with Washington, on the other, engaging in an arms race that only heightens the danger of war. Neither regime has anything to do with socialism or represents the interests of the working class. Their whipping up of nationalism acts as a barrier to the development of unity among workers in Asia and the US in opposition to imperialist war. The prospect of a catastrophic war stems not from particular individuals or parties. It is being driven by the deepening crisis of international capitalism and the insoluble contradiction between world economy and the division of the globe into rival nation states. The same crisis of the profit system, however, creates the objective conditions and political necessity for the working class to fight for its own revolutionary solution—a unified anti-war movement of the international working class based on a socialist perspective to put an end to capitalism before it plunges humanity into barbarism.